Within one day of the release of its debut album, TXT, the new boy band from BTS’ management agency, took global album charts by storm Tuesday. The five-track album, “The Dream Chapter: Star,” which hit the global music scene Monday evening, topped the iTunes album charts in 44 countries and regions, including the United States, Mexico, Brazil, Spain, Norway, Russia, India, Hong Kong and Singapore as of Tuesday. Also released Monday evening, the music video of the album’s lead track, “Crown,” garnered more than 13 million views on YouTube, successfully launching TXT on the K-pop scene. v”Many people were curious about the meaning after hearing the title of our song,” member Taehyun said during TXT’s debut showcase for the media on Tuesday at Yes 24 Live Hall in eastern Seoul. “The horn symbolizes the confusion and sudden changes a boy experiences when he enters puberty,” Taehyun said, adding that his sense of confusion turns into joy and empowerment when he meets other boys like him. The horn leads the boy to think he is a monster and becomes a source of pain, but it eventually turns into a crown as the boy grows up, according to the song’s lyrics written by six creators, including Bang Si-hyuk, the founder of Big Hit Entertainment, which is the music house behind BTS, and Slow Rabbit who produced music for the group. The six members of TXT also jointly composed the song. “We prepared (for this debut) for a long time,” Yeonjun, TXT’s eldest member at 19, said. “TXT brought together five different members with the same dream of becoming singers. We will continue to work hard,” he said. “‘Crown’ is characterized by energetic performances of the five members with the addition of popping dance elements that give a unique feeling of group dancing,” according to Yeonjun. TXT is the first music band in six years by Big Hit, which started as an anonymous startup to write K-pop history with the sensational global success of BTS. 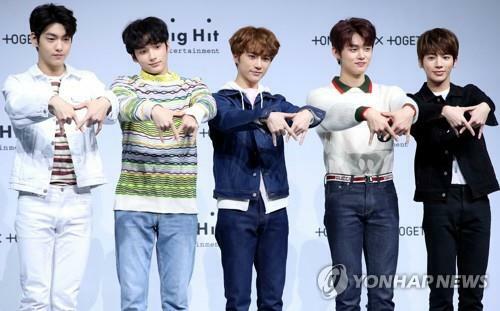 TXT feel it is “too generous” for them to be called a successor of BTS, member Beomgyu said, adding that he was surprised to hear about the band’s chart performance. Team leader Soobin referred to Big Hit’s head Bang. “Producer Bang advised us that only practice can be the foundation for our confidence onstage. He said he also gave that advice to BTS from their start so the BTS members still have the habit of practicing before going onstage,” according to Soobin. “Bang also told us that we should cherish the value of our team,” Hueningkai, the youngest and the only American member, said. Members said TXT aims to take the rookie of the year award. “We crave the award since it’s an award you can win only once,” according to Soobin. “I heard that artists from Big Hit should prove themselves with albums, rather than songs,” member Taehyun said. Yeonjun also expressed the team’s goal to make inroads into the world market, as BTS has. Beomgyu and Hueningkai are also aspiring producers who hope their songs can appear on TXT albums one day.